With a normal airway, air passes through the nose and past the flexible structures in the back of the throat (soft palate, uvula and tongue). During sleep the muscles relax but normally the airway should stay open. When you sleep on your back, gravity does make the tongue fall back more, but if the muscles have good tone they will prevent snoring by keeping the airway open. Individual anatomy does play a role also, as a large tongue and/or excessive soft tissue in the throat area (a large uvula or large tonsils) can make it more difficult to keep the airway open. Snoring is created by the vibration of the soft palate and uvula against the tongue as air passes through an airway that is too small to allow for smooth, unimpeded airflow. With snoring that is not associated with apnoea, the back of the tongue is not resting completely against the back wall of the airway so that some air is still able to pass through the airway. When the air flow is partially restricted as is the case with snoring, this often causes what is referred to as Upper Airway Resistance Syndrome (UARS). Individuals with Upper Airway Resistance Syndrome have some of the same symptoms as those individuals who suffer from obstructive sleep apnoea (OSA). The most common symptom is fragmented, non-refreshing light sleep which results in excessive daytime sleepiness. With OSA, the entire upper airway is blocked which causes airflow to stop. Airflow must completely stop for at least 10 seconds for it to be considered as an apnoeic event. This blockage is caused by the base or back of the tongue resting entirely against the back wall of the airway, and it results in a complete stop of the airflow. If the airflow stops for at least 10 seconds and this occurs five to 15 times per hour while you are sleeping, then this is considered mild OSA. If the airflow stops for at least 10 seconds but it happens 15 to 30 times per hour while sleeping then it is referred to as moderate OSA. And if it occurs more than 30 times per hour then this is considered severe OSA. Most people who have sleep apnoea also tend to snore. With sleep apnoea the tongue does not completely block the airway though out the entire night. Depending on how much and for how long the tongue blocks the airway, a partial blockage may occur causing snoring but no sleep apnoea. 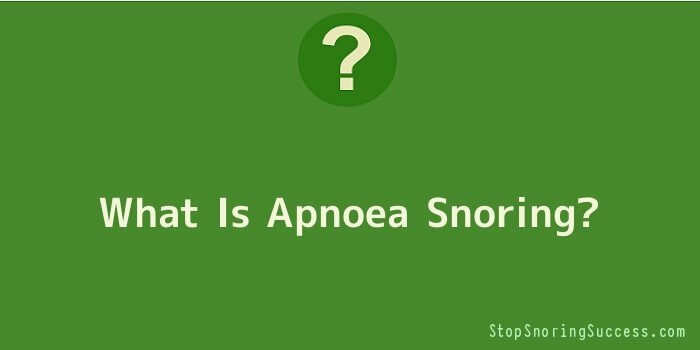 Apnoea snoring means you have a combination of both snoring and apnoea. The two events are usually separate, so that when snoring is heard from someone who has apnoea, partial airflow is occurring and there is not a complete blockage resulting in an apnoeic event. Also, when someone who has OSA stops breathing for at least 10 seconds, this can cause a gasping for air when breathing resumes. The gasping can resemble snoring. If you are sleeping in the same room as an individual who gasps for air throughout the night then sleep apnoea is most likely occurring. The usual treatment for sleep apnoea is to use a CPAP machine that keeps the airway open by blowing air through a mask that you wear throughout the night. CPAP can stop the snoring but unfortunately is tolerated by less than 50% of those who try it. Another option to stop apnoea snoring is to use a snoring mouthpiece that positions the lower jaw forward and keeps the tongue away from the palate, uvula and back wall of the airway.